Demolition by neglect is when old buildings are destroyed not by the wrecking ball, but by time and neglect from owners who either don’t care about their condition or wish to raze a protected historic structure but can’t get permission to do so. Too often historic homes are in local historic districts that don’t allow demolition except under extreme cases, so they are simply left to rot and fall into such disrepair that they cannot feasibly be repaired. If we want to preserve our history it important that we find a way better than throwing up our arms and whining that those preservation bullies are letting yet another building fall prey to demolition by neglect. So I’ve got some suggestions for you whether you are a preservation professional or a neighbor witnessing this happening in your own town. Being a victim accomplishes nothing, but taking action can change everything. I’ve never been a passive person and when I see someone skirting the rules it really steams me! I’ve written previously about how demolition is a choice, not a solution, but the problem still continues. So these suggestions below, if your town has the gumption to implement them, should significantly slow down or even stop demolition by neglect. Let me know your thoughts. If a homeowner neglects a property a lot of cities place fines on the property, but those fines are often simply ignored by the owners who know that they can often be forgiven or aren’t necessary to be paid until the property sells which could be years or decades away. What if the fines were applied to the property tax bill every year by the property appraiser and the neglecting owner had to feel the pain of them every year with their tax bill? That might encourage a little action. If a city suspects that a building is subjected to demolition by neglect then in addition to not allowing a demo permit they also ensure that a permit for new infill construction on that property will not be allowed. They would only be issued a permit for the repair and restoration of the building and perhaps that repair permit would be free of charge. Stop enabling bad behavior and you’ll get less of it. With the advent of social media, shame is used in too many bad ways, but it can also be a force for good too. Just like deadbeat dads need to be called out and encouraged to do the right thing the same could apply to property owners who are playing the dirty game of demolition by neglect. Now, this can easily go too far by shaming a neighbor because their lawn hasn’t been cut, or painted their house a weird color, but used appropriately social shame can move mountains and a strong neighborhood association will often scare off potential demolishers. If you can keep the weather out of a building you can keep it protected until a more responsible owner comes along. This might be cross the lines on private property rights, but if you leave a vacant house with broken out windows and a failing roof could a city have the right to tarp the roof and board the windows up to not only protect the house from neglect but also protect citizens and neighbors from the dangers of a house that might collapse? I don’t know, but asking these kind of radical questions is the only way to start finding solutions to this problem. I’ve giving you six ways that could potentially fight demolition by neglect, but I want to hear your thoughts too. What is working your area? What is absolutely not working? This is a very real problem for historic buildings and it needs address by all of us no matter where we are. Let’s keep talking about solutions and maybe soon we’ll find some that really work! The post 6 Ways to Stop Demolition by Neglect appeared first on The Craftsman Blog. Asphalt shingles were invented in America in 1901 as a low cost and fire resistant alternative to the available roofing materials of the day. They were originally cotton rag soaked in asphalt with a variety of granules such as slate, mica, or even oyster shells added to the the surface for increased durability. You might not give much thought to asphalt shingles since most of us don’t see our roofs up close unless there is a problem or you’re just particularly fond of heights. But you should definitely give your shingles a considerable amount of thought when it comes time to replace your roof because they are the main thing protecting your house from the weather. Even more important than keeping your house painted, the proper asphalt shingles (installed well) can make your roof last a decade longer than a poor shingle. In this post, I’ll give you my take from experience as a general contractor of what shingles work and what are not worth your time. 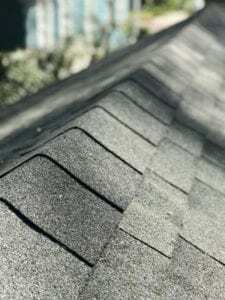 There are a lot of things to consider when choosing the right asphalt shingle and I’ll walk you through the things you should be paying attention to since the cost of the shingle is such a small portion of the overall cost of a new roof. The first shingles were originally just single shingles unlike the wide multi-shingle sheets on the market today. Over the years, the backing material, granules, and construction of asphalt shingles has changed considerably, but the basic premise has remained the same. Their resistance to wind and hail damage has been greatly increased over the years as have the styles available to create a high quality roofing material. Like most building materials, the composition of asphalt shingles was largely natural materials at first before moving to more manmade versions later. In the 1920s, due to increasing costs, the original cotton backing soon became too expensive and other materials like wool, jute (see linoleum), and wood pulp were experimented with. In testing done around the time, most of these bases showed no significant performance differences so for the next couple decades there were a variety of backings used depending on the region and manufacturer. The 1920s saw huge growth for asphalt shingles due to a campaign by the insurance companies to address the growing fire risks in America’s cities. Wood shingles, while popular and affordable created significant fire risks, whereas asphalt shingles provided fire resistance and affordability. With the advent of the great depression and asphalt shingles availability as an affordable roofing material, they only saw further growth through the post war building boom and following decades. In the 1960s, fiberglass mats were introduced to further improve fire ratings of roofs and replace the asbestos containing shingles that found their way onto the market. While fiberglass shingles were too light to withstand high winds, originally they were eventually improved to the point where they surpassed asphalt shingles with natural backings popularity in 1982. In the 1990s, manufacturers worked very hard to improve the wind resistance and impact resistance of asphalt shingles, especially following devastating hurricanes like Andrew in 1992. Today asphalt shingles have been improved so thoroughly that many receive the highest wind and impact ratings available for roofing materials. Since the cost of a new roof is mainly labor, picking a more expensive shingle is not as financially painful as you might think. Doubling the cost of your shingles adds only a small increase to the total cost of a roof. So what should you be looking for in a quality shingle? Just like anything you do get what you pay for so even if a cheap shingle looks great, there should always be some skepticism about why it’s so cheap. Let me outline the important aspects of asphalt shingles here. You want a shingle to stand up to storms especially if you live in a high wind region like Florida or the plains which are subject to hurricanes or tornados. Yes, you can save a little here if you don’t live in a high wind zone, but is it really worth it since the chances or a strong storm coming through your area in the next 20 or 30 years is pretty good no matter where you live. Below is a list of wind ratings for roofing materials. A beneficial feature you may want to consider is what impact rating your shingles need. There are four levels of impact resistance, which essentially measure how well the fiberglass mat will hold up to hail and other debris. The higher the rating the stronger the shingles resistance to hail hitting your roof. That’s never a bad thing. Unlike the the wind resistance, I think that paying for the highest impact rating is not a forgone conclusion. You need to think long and hard about the kind of weather your area gets before deciding which impact level is right for your house. I like having a little fun with testing products and the video below is a great example of what Class 3 and 4 shingles can stand up to. Grab a soda and check it out! 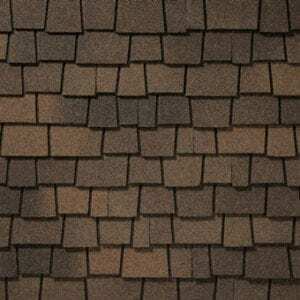 The traditional 3-tab shingle has been around for years, but in the last couple decades, the rise in popularity of architectural shingles which do a good job of replicating the texture and dimensions of wood shingles has in my mind been a big improvement. Architectural shingles tend to last longer and hold up better since they are thicker and generally built with better construction. You can find scalloped shingles, shingles made to look like wood shakes, and all kinds of other custom shapes to fit the style of your house. This is especially helpful to us old home owners who need something that matchesthe architectural style of a historic home. There is no right or wrong decision here, but the style is definitely something you should be thinking about since you’ll be living with it for a long time. Color is a bigger deal than you might think. Yes, it defines the look of your house and is more difficult to change than a bad paint job, but it also plays a large role in how energy efficient your house is. When I hear people rail about how important energy efficiency is and then watch them put a black shingle roof on their house I realize that all their talk of “green living” is likely just talk. The lighter shade of shingle you choose greatly affects the heat generated by your roof. In northern states, a dark roof might well be desirable to capture as much heat from the elusive winter sun, but if you live in the south, then having black roof can increase your cooling bill significantly. 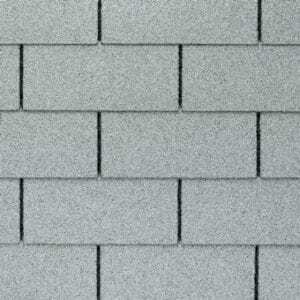 I’m not saying you should go out and buy stark white shingles, but realizing the huge difference that shingle color can play should definitely weigh in on you decision of what shingle to buy. Think of it this way, on a sunny day, a black roof can be as much as 100 degrees warmer than the ambient air temp, while a white roof will only be about 20 degrees warmer. Think about not only your utility bills, but also the fact that a roof assembly that stays cooler has a longer life than shingles that are consistently overheated. There are a lot of warranties out there and while I’m not as focused on this aspect, it is often important to look into since your roof is a significant investment. Does the warranty cover materials only or does it cover materials and labor. Is it pro-rated or is it full coverage? How long does it last? How established is the company? If you have a 100-year warranty from a 2-year old company, that’s not quite as valuable as from an 80-year old company since your warranty is only as good as the company who honors it. You should be armed with enough information to pick the right shingles at the right price for your house now. Don’t get too hung up and on the different manufacturers special options. The main issues are what we have discussed, and following these guidelines will help you compare apples to apples so you don’t accidentally end up with a lemon. Just like any home improvement purchase, take your time and put your hands on some shingles before making the final decision. Do they feel significant or do they feel cheap and weak? Your gut is a good guide once you can get the product in your hands and see it in real life rather than on a computer screen. Use the facts above and trust your gut and you’ll be just fine. Happy roofing! 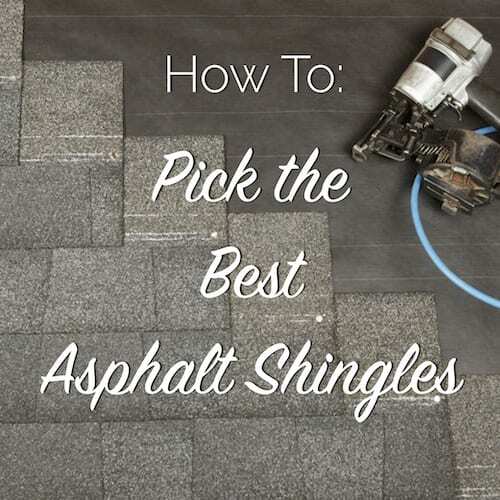 The post How To: Pick the Best Asphalt Shingles appeared first on The Craftsman Blog. 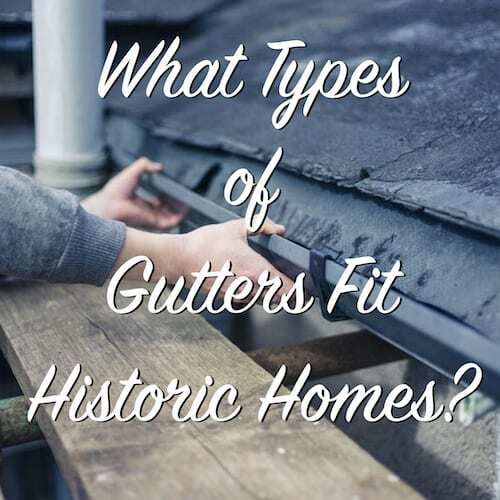 The post What Types of Gutters Fit Historic Homes? appeared first on The Craftsman Blog. Below, you’ll find six of the best gutter cleaning tools available today to not only keep your gutters clean, but keep your feet on the ground. 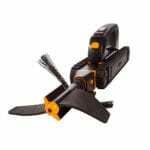 There are tools in every budget range and for almost any gutter setup included. Spring and fall are the times when gutter cleaning is imperative. Clogged gutters can quickly cause major damage to your roof and fascia as water overflows and finds its way into the dark corners of your soffit. 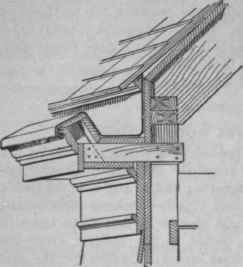 No one likes to climb on the ladder to dig leaves out with your hands, and some people hate it so much that they invented these creative solutions to gutter cleaning. 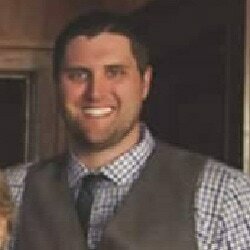 I hope you’ll find some good options below for your house and unique situation as you work your way through your home maintenance checklists. What this tools lacks in creative naming (how many numbers and letters does it really need?) it makes up for in clever and simple design. Add this attachment to the business end of any pressure washer and place it into the gutter and blast leaves and debris in two directions. You’ll need an extension pole and if you don’t have a downspout on both ends of the gutter, then this does work a little less efficiently since it blasts debris in both directions, but the ease of use cannot be denied. 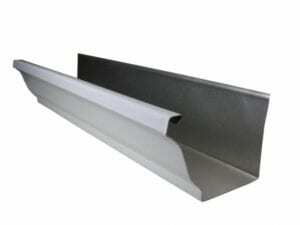 This is as simple and inexpensive as it gets for gutter cleaning. Sure, you’ll have to climb up on a ladder and remove the debris by scooping it out, but at least you won’t have to use your hands and at less than $5 what more did you expect? I like to keep it simple and this scooper certainly accomplishes that in spades. Funny name, serious product! 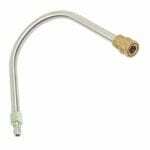 Add this curved attachment to the end of your pressure washer and you’re off. Angel the spray head whichever way you need and start at the high end of the gutter and blast all that gunk toward the downspout. 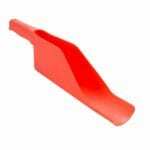 It also works great for clearing jams in the downspout. There’s nothing gimmicky here, just a simple design that is hard to mess up or claim you can’t understand. 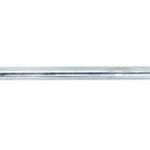 If you want to keep your feet on the ground while cleaning your gutters, then you’ll need a few of these extension wand to get your tool of choice in the right location. Depending on the height of your gutters, pick up a few of these extension wands so you’re ready to roll. 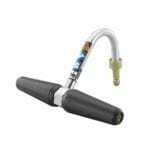 The Simpson Extension Wand comes with a 1/4″ quick connect already installed so that adding your attachment of choice is simple. This one is for all the techies out there. Sure, you could do the manual labor yourself or choose some of these low tech options, but you could also go the high tech route and get this gutter cleaning robot! iRobot, the creators of popular Roomba also created this workhorse to get your gutters clean. I have not used this little before and I’m not quite sure how it works personally, but their website reviews give it 3.8 out of 5 stars and Amazon has hundreds of reviews scoring it about the same. So, from that I would guess, it gets a B+ for functionality, but A++ for coolness. This little guy attaches to a standard hose and can blast dirt and leaves out of not only your gutters but also larger pipes. 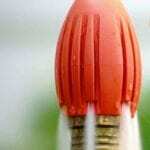 Simply push the hose along and the water rocket blast debris out the backside of the gutter and down the downspout. Considering you don’t need a pressure washer or any other tools, this one was pretty appealing to me. You can get started right away without asking your neighbor to borrow yet another tool. Below I included a quick video of the iRobot Looj in action since as the most expensive options you should definitely do a little more research before plunking down a couple hundred dollars. Let me know your thoughts in the comments below! 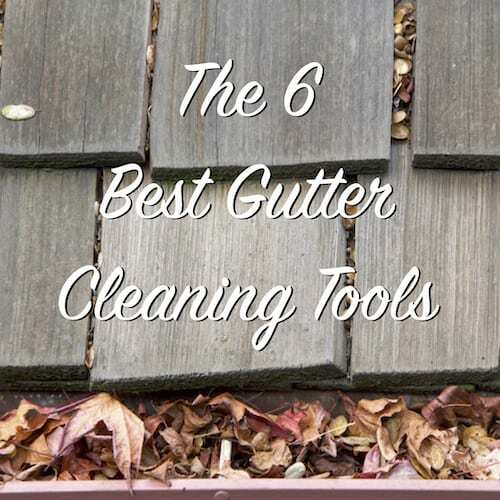 The post The 6 Best Gutter Cleaning Tools appeared first on The Craftsman Blog. 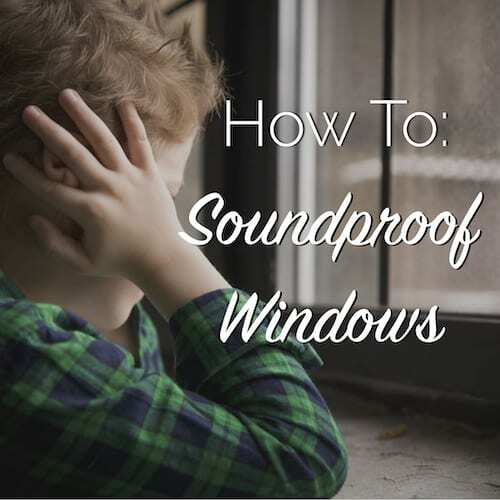 The post How To: Soundproof Windows appeared first on The Craftsman Blog. Once the threat of winter has passed and you have dug out from the season of snow and ice, a simple spring home maintenance checklist of “honey-do” items will get your house ready for the much anticipated warmer weather. Make minor fixes now to avoid big expensive problems down the line by following this simple list of annual maintenance items. This checklist of exterior spring cleaning items shouldn’t take you more than a single day and is a big time and money saver, if you can complete the list every year before the spring gets into full swing. Your house paint can last a long time with minimal maintenance, but one of the simplest ways to extend that life is by touching up chips or bubbles that have occurred a few times a year. Take a little brush and touch up any missing paint to prevent water from getting trapped behind the paint and causing premature failure and rot. Snow and ice take a toll on your roof no matter what material it is made from. Once the ice has all melted, give your roof a once over to check for items like missing or loose shingles, bent vent pipes or built up debris. It’s not always necessary to break out the ladder and climb up top, but if you’re careful, that always yields better results (just be careful!) Replace any missing shingles, clear off the built up leaves, branches, and other debris and inspect the flashing to make sure you’ll be leak free for those spring rains. 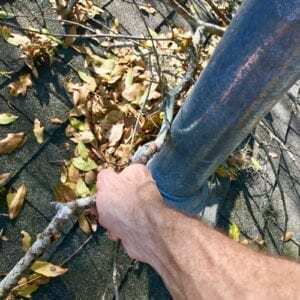 Your gutters are inevitably clogged from those fall leaves you forgot to deal with so while you’re on the roof take the time to get them cleaned out and free flowing again. Clogged gutters are a major source of rotten fascia, soffit, and rafters so keeping them clear will avoid those expensive issues later. 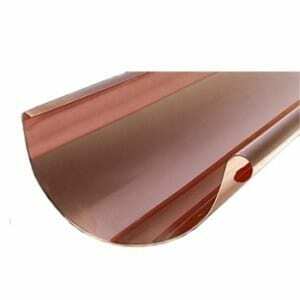 If you don’t already have some installed, get some leaf guards to keep them cleaner longer. I really like the Flexpoint Leaf Guards since they seem to do the best job of letting water through and keeping leaves out in my opinion. Freeze, thaw, freeze, thaw. It takes a toll on plumbing fixtures outdoors, so before the hot summer months, get here and you really need those sprinklers give them a little test to see that you don’t have any broken pipes or misaligned sprinkler heads. I’ve seen a lot of misaligned sprinkler heads that were hit by the snow shovel over the winter spray their water on the house rather than the flowers. Adjust those sprinklers so they are not spraying on any part of the house creating a breeding ground for wood rot. Are those Adirondack chairs looking a little rough? Probably since varnish only holds up for a year or so outside. Now’s a great time to take those chairs and other outdoor furniture to the garage and get them resealed before the rainy season hits. You’ll want to wait for consistently warmer weather before doing the same to your deck because temps need to be above the mid 50’s even at night before you can apply new stains or sealers outdoors. It may not be time to swap out thestorm windows for the screens yet, but doing a spring tune up of your windows is always a good idea. Inspect them for any rot or missing glazing putty, replace broken glass or broken ropes as needed. If you need to pull the sash out for a little maintenance in the garage, you still have your storm window up and protection so this is a great time to do some work on your windows. Below is a spring tune up webinar I did for Indow in 2018 to give you some good ideas for quick improvements you can make to your windows in preparation for spring. Before the summer is here you can save some money by getting your AC serviced in the off-season of early spring. Prices for service are usually lower and the schedules of local techs are much better. Plus, making sure your AC system is tuned and ready for the hot months now will give you some peace of mind because replacing it in July is way more painful than doing it in the cooler spring months. 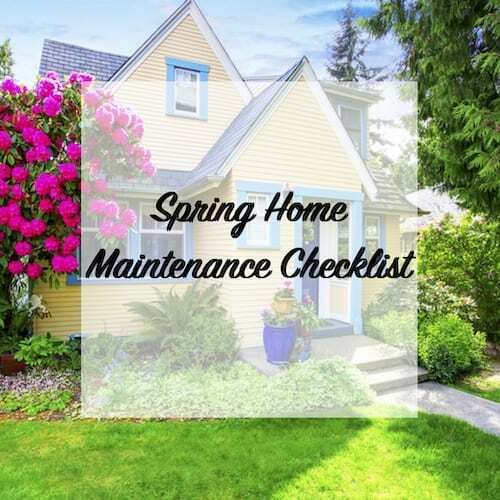 Work your way through this simple spring home maintenance checklist one Saturday and you and your house will be ready to enjoy a problem free spring. Good luck and thank goodness spring is here! The post Spring Home Maintenance Checklist appeared first on The Craftsman Blog. In older buildings, the crawl space is an 18″ to 36″ space between the floor of the building and the earth where mechanical elements like electrical and plumbing are often hidden. This overlooked piece of the house is important to understand because it can cause major issues if neglected. Your crawl space: it’s dark, it’s scary and if you’re like most of us, you have no idea what’s lurking down there. If you own an old house that was built before the slab on grade craze after WWII, you likely have a crawl space foundation. A crawl space was sometimes part of a pier and beam foundation where the builder simply had a mason install brick or stone piers spaced evenly across the foundation to support the home, or it is part of a stem wall construction where the crawl space is enclosed, except for regularly spaced vents to encourage ventilation. 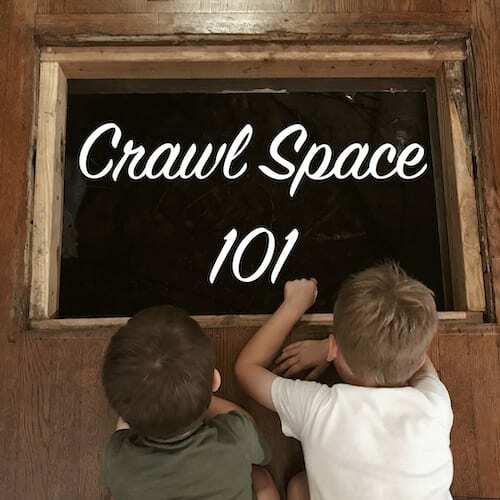 Why is the Crawl Space Important? The crawl space holds a lot of secrets to your old house and can provide a lot of information about past issues and potential future issues. Understanding how it functions best and how to treat it will make you a rock star homeowner and save money and trouble down the line. Your crawlspace needs to be ventilated. Period. Unless you are building a new zero-energy Passivhaus your crawlspace was likely designed to be ventilated to avoid problems. Ventilation allows moisture from the earth to escape through the vents rather than work its way into your house, potentially causing mold and mildew problems. Before you listen to the insulation guy who tells you to seal it up and make it airtight, think for a minute about why those vents were installed in the first place. Unlike those poor sobs with a slab foundation, you have access to all your mechanicals like plumbing, electrical, and HVAC (sometimes) by crawling around under the house. Nobody likes climbing down there, but it’s a lot easier than jacking up a hole in a concrete slab to repair a burst pipe or upgrade your electrical. Inspecting for potential issues and making repairs in much easier in a crawl space, so count your blessings. Not only are you able to spot issues with your mechanicals, but you can also nip other problems in the bud. Inspections are much easier in a crawl space where you can more easily spot and remedy issues like subterranean termites, wood rot, and foundation issues. Another plus is getting to play detective. I can tell if there was fire damage at one point, tell what kind of fasteners were used on the foundation, check to see what’s underneath those tile or linoleum floors and if they were original, and a host of other things. There are a few things you need to do to secure and protect your crawl space and fortunately, they don’t require constant work. They are very much a once and done kind of thing and once they are completed, you can avoid sticking your head down there except for the random curiosity. Protecting your crawl space from critters like mice, rats, raccoons, squirrels, or the neighbor’s feral cats is more important than you may think. If not sealed up, your crawl space is a warm bed for any critter looking for a home. Those pests tend to chew on warm electrical wires, tear open plumbing pipes for a drink, make nests in you insulation, and leave their messes behind. Critters in the crawl space are NOT a good thing, and you need to seal things up in a way that keeps them out for good, but allows airflow. My favorite tool for this is 1/4″ hardware cloth that keeps most anything at bay when secured properly. I’ve written another post about How To Keep Critters Out of Your Crawl Space that you can read here. In stem wall construction, moisture continuously evaporates from the earth and makes its way into your crawl space since these are not as well ventilated as the more open design of the pier and beam foundation. To keep the humidity at bay, you need to lay down some plastic sheeting covering the dirt. Black 6 mil plastic works best and is fairly inexpensive. The Spruce has a great how to post on the topic. Radon is an odorless, tasteless radioactive gas that occurs naturally in the earth and can seep into your crawl space increasing your risk of cancer. It sounds terrifying, but in reality, it is not difficult or expensive to fix. The thing is that you have to have someone test for it to know if it’s an issue. It is more common in the northern parts of the US, so having a test for peace of mind is definitely worth it especially if you have neighbors with positive tests. Now you’re a pro about crawl spaces. You know what the potential issues are and you know how to resolve them. It doesn’t take much to get your crawl space in tip top shape, and once you make these few improvements, you’ll be able to forget all about that dark scary place again. Before you switch into “out of sight, out of mind” mode again give some thought to how you can improve that dark corner of your house called the crawl space. The post Crawl Space 101 appeared first on The Craftsman Blog. When the economy is chugging along and money is flowing through our society, it seems to me that some terms get new definitions. The line between “need” and “want” is blurred beyond recognition. Another couple phrases whose definitions get a little hazy is the difference between “have to” and want to”. While these can be annoying, there is another phrase that is tossed about with no regard to its actual definition and that phrase is “beyond repair”. How often have you really come across something that is truly “beyond repair”? 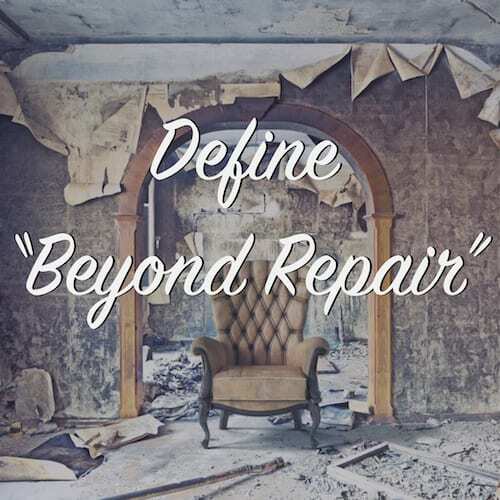 Sure, it may be too expensive or even sometimes impractical to repair, but that’s not the same as “beyond repair”, Beyond repair implies that there is absolutely no way to fix something. It’s irreparably damaged, old, worn out, or whatever. Let’s be careful with our words, though, because words have meanings and when we change those meanings, the results are not good. In this post I want to talk about “beyond repair” and what this potentially dangerous term means in historic preservation, because I feel like it is being used to justify all kinds of architectural wrongs and I want the damage to be stopped. Typically, we use this term the same way we talk about a car being totaled. It’s not that your mechanic couldn’t fix the car, but it will likely cost more to repair than the book value of the car is worth. Why sink $4,000 into a car that is only worth $2,000, right? So, something is beyond repair if the following formula applies. What do you think? Can we agree on that definition of beyond repair? I feel comfortable with it since it can be applied across a wide variety of items and their valuations. So, then we need to agree upon a method to accurately find the value of an item. As you’ll see below, this can prove a bit more difficult. How Do You Value Old Buildings? The book value of a car, or a piece of land may be easy to calculate, but the value of a historic building is not as clear. Yes, you can go to the local property appraiser and find out what your home is “worth”, but would any of you feel good about selling your house for what the property appraiser lists it at? How about selling your house for what the insurance company values it at. No thank you! So, then for difficult to value items like historic buildings, how do we come up with an appropriate value? For most real estates, a local realtor can help with a basic valuation since the price of real estate is extremely localized. But, how do you put a value on the endless intangibles incorporated in an old building? Things like custom woodwork, wavy glass, unique and hard to find hardware, old-growth lumber, etc. Those are hard to value with any degree of certainty. We all know they are worth more, but how much more? Then there are the really intangible things like local history. Was your house built by the first mayor? Was a famous writer born in the house, or the town’s first doctor? Maybe it was part of the underground railroad during the civil war, or it had a distillery in the basement during prohibition. There are so many stories incorporated into our historic buildings that are almost impossible to value. After all, the house built by the town’s first mayor is the only house like it in the world. How do you pull that comp? What about valuing a building during the great recession in 2009 vs in 2019? It’s the same building but those numbers would be vastly different. Does that mean that in a down real estate market there are more buildings that are “beyond repair”? Struggling through this valuation we can see that determining a true value of a building that incorporates the book value and intrinsic value is really difficult if not impossible. If you wanna know the real reason most people toss this phrase around, it’s because they are copping out, in my humble opinion. Here are some of the responses I’ve gotten on projects I’ve sometimes been awarded and sometime lost to the wrecking ball to show you what I mean. Saving Original Windows: Developer says, “they are beyond repair” Translation: It’s too expensive to restore them to turn a quick profit on this project. Saving Historic Brick Facade: City says, “it is beyond repair” Translation: The new anchor tenant wants to move in quickly and restoration will take longer than demolition. Painting Wood Clapboards: Homeowner says, “they are beyond repair” Translation: Wood requires regular maintenance and I want vinyl siding because I’m tired of maintaining my house. Ultimately, this comes down to private property rights and how much tenacity local historic preservation ordinances have. I don’t think I would have a problem with the phrase beyond repair if it was used to accurately describe the situation, but that is not the case. Using it as a cop out so you don’t have to be a responsible property owner and steward of the piece of history you own is no excuse. Bottom line for me is that if you don’t want to fix it, then have the guts to tell us that’s why you want it replaced/demoed/razed, but stop lying to the rest of us that the reason you’re choosing to NOT restore is because it’s “beyond repair.” Put on your big boy pants and tell the truth, that’s what adults do. If you own a piece of architectural history whether it’s a house or a high rise, have the guts to tell it like it is and let the cards fall where they may. The post Define “Beyond Repair” appeared first on The Craftsman Blog. It may seem like a daunting task to restore your own windows, but I’m here to tell you that just ain’t the case. If you’ve got two thumbs, then you can scrape paint and that is the hardest part of any window restoration project. 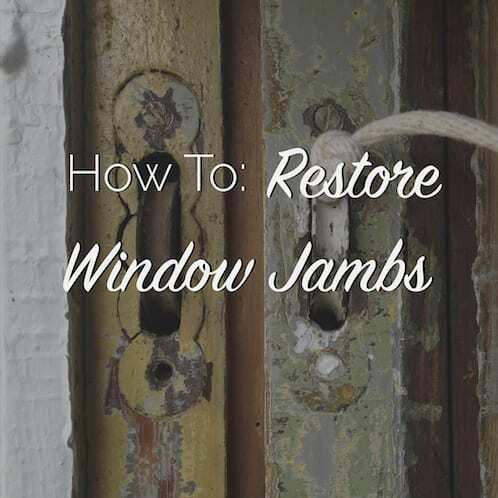 Learning how to restore window jambs, while the most physically demanding part of any window restoration project, is the least technically difficult. I could write out all kinds of instructions for you on the topic like I used to do before the days of video streaming on the internet, but today I figure a video is the best way to show how to restore window jambs since a picture is worth a thousand words and video, well, that’s worth a thousand pictures so you do the math! I will give you guys the materials and basic steps below so you have the right order of operations, which is immensely important. This post will also contain a primer video that shows you removal of the sash and all the mechanical work involved in a jamb restoration. I tend to think of the mechanicals as a separate item, that’s why I’ve broken them out into the other video. The first step is getting the sash out so the jamb is exposed and ready for restoration, you’ve gotta pull the parting bead and stops off to ready for the repairs you need to make. Sure you can leave them in, but it often makes it easier. The video below will show you exactly how to get the sash out and also covers the mechanical elements of the window like ropes and pulleys. Check this video out to get you started and prepped to begin your jamb restoration. Okay, the sash are out and your jambs are ready and waiting for you. What on earth are you supposed to do to get these jambs ready for those beautifully restored sash you’re going to put back in them? First, you’re going to need some supplies to make sure you are setup for success. Below is the list of everything I use in my jamb restorations. Grab your scraper and take all that excess paint off of the jambs. This built up paint makes it extremely difficult for the sashes to slide smoothly, so removal really is necessary. You don’t have to go all the way to bare wood, but the build up definitely needs to be brought back down. You may have larger repairs that require some more complex carpentry which happens from time to time, but usually it’s nothing a little epoxy can’t take a care of. I’m a big Abatron fan, so I use their epoxies listed above. Clean out the loose wood, apply your LiquidWood, then fill the voids with WoodEpox. If you’re nervous about using epoxy, don’t worry, the Abatron system is extremely simple and I’ve got a detailed post on doing these epoxy repairs right here. Can’t leave everything rough and ugly, so I give everything a good sanding with an 80-grit paper to make sure it’s all smooth. Then clean off the surfaces with a tack cloth or damp rag and you’re ready for the next step. Put on a solid coat of primer and once that is dry, finish the jambs with a good enamel paint. It doesn’t matter if it’s oil-based or water-based, as long as you’re using a paint with a hard finish that’s meant for exterior conditions. Below is the video to show you those 4 simple steps in action. While the video below is only 2 minutes, the whole process takes a couple hours of work, not counting drying times, so, do plan accordingly. It can easily be done in phases if your schedule requires. That’s it! You’re now ready to restore the jambs and mechanicals of almost any double-hung window with both of these videos in hand. If you’re planning on tackling this yourself be sure to pick up a copy of my book Old Windows In-Depth that covers everything from A-Z about restoring your windows. It’s the perfect companion for anyone looking to restore wood windows. The post How To: Restore Window Jambs appeared first on The Craftsman Blog. Hello I am Arom Hope from california. I have three years of working experience as Home Restoration Service Cleaner. I spend most of my time watching videos about home restoration tips and read articles about home restoration.